My name is Stephanie Crawford, and I am an Environmental Scientist at an environmental consulting firm in Miami, Florida. As part of my job, I conduct environmental assessments of projects, which includes field work such as SCUBA diving, wetland delineations, and coral relocations. Prior to my current position, I received my Master’s in Marine Affairs and Policy from the Rosenstiel School of Marine and Atmospheric Science (RSMAS) at University of Miami. Living in Miami enables me to enjoy the water as much as possible all year round! 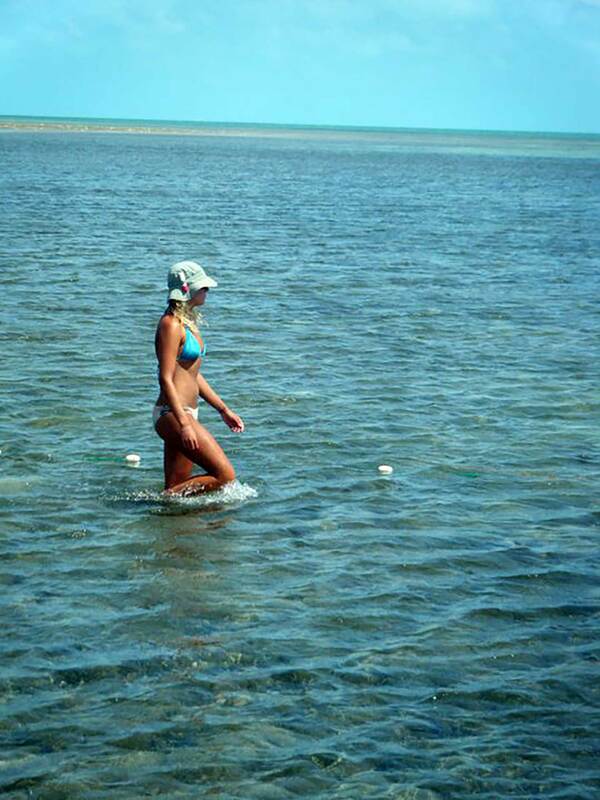 Such a cliché, but I love being in and on the water; including swimming; snorkeling; diving; paddleboarding and sailing! These are all things I wouldn’t be doing if I had not volunteered at the Sharklab in 2010. Before my first visit to the Sharklab, I was working retail back home in rural Maryland after undergrad to earn any sort of income as I could. After being painstakingly bored of my life, and knowing I wanted to continue my science background from undergrad, I moved out to California to spend a few months catching leopard sharks and rays for a population study. Here, I fell in love with the work I was doing, even though it was the cold Pacific water and not a ray of sunshine all summer! I returned home to Maryland and did a Google search of “cool marine biology jobs “ (yes, I remember what I actually entered). And BBFS came up! I applied immediately and was so excited at the thought of going to the Bahamas, which I had never been to before, and learning more about sharks and gaining more experience. Next thing I knew, in January 2010, I was on a plane headed to Bimini! My plan was to only stay for 3 months, but then it was another month, and then just one more month, and then I stayed for the PIT project. And after 6 months, I headed home again. 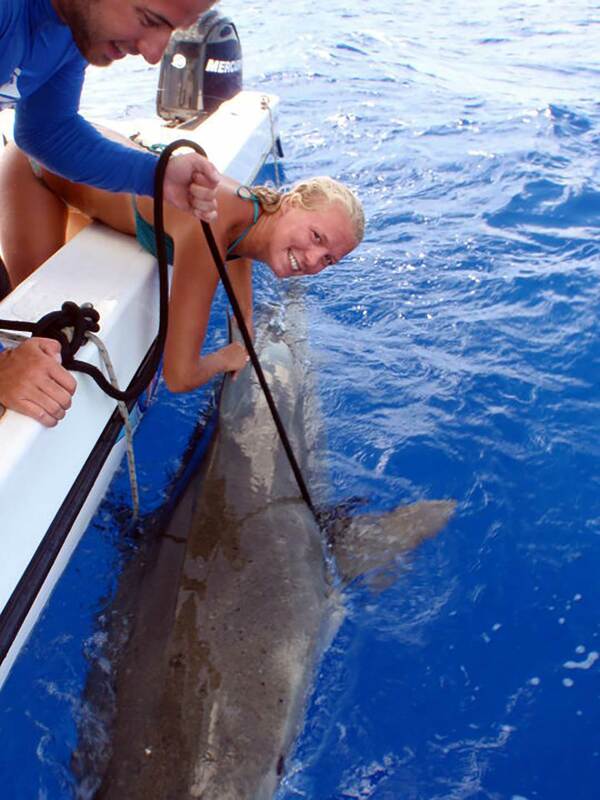 But then in January 2011, I was lucky enough to be a part of the Jupiter Lemon Shark Project, in Jupiter, FL. This project lasted 3 months, and then right after I went back to Bimini for the second time to volunteer until I started my graduate program in August 2011. I truly believe that if it weren’t for my experience at the Sharklab and relationship with Doc, I am not sure I would have gotten into such a prestigious program as RSMAS. Not only did my experiences help get me into graduate school, but my knowledge and understanding of sharks and ecosystems, rounded me to become even more passionate about conservation and protecting what little marine habitats we have left on this Earth. I have been to many other islands in the Bahamas, but Bimini captivates me. The health of the reefs has been the best and the most interesting that I have seen. I have never been anywhere else where I have seen so many different species of sharks, which is just one characteristic that makes Bimini so unique. There are probably hundreds of stories people have about Doc, but one I have personally experience being the most CRAZY, would have to be when National Geographic was filing for a show, and we built a box for a Tiger shark. I cannot even recall why we did something so ridiculous, but all I remember was this idea failing miserably! But my first time at the sharklab, I was tasked to go out on the Twin Vee with Doc and some students for a course, to help him anchor the boat for a shark dive, which was the highlight of almost everyone’s time. All I had to do, was to let out the anchor line to Sean, who was going to free-dive the anchor into the rocks to anchor it properly. However, I do not believe Doc was keeping the boat in control while I was doing this, causing the anchor line to get wrapped around the prop of the engine, which delayed the anchoring process, shark dive, etc. Doc was screaming at me at the top of his lungs because I was messing up the line. However, he used some words I will not mention ;). I did not let his screaming at me upset me that much, mostly since the staff warned me from the beginning ‘ he WILL yell at you ‘. So I was prepared…I guess. Working and the Sharklab has changed my life. Period. 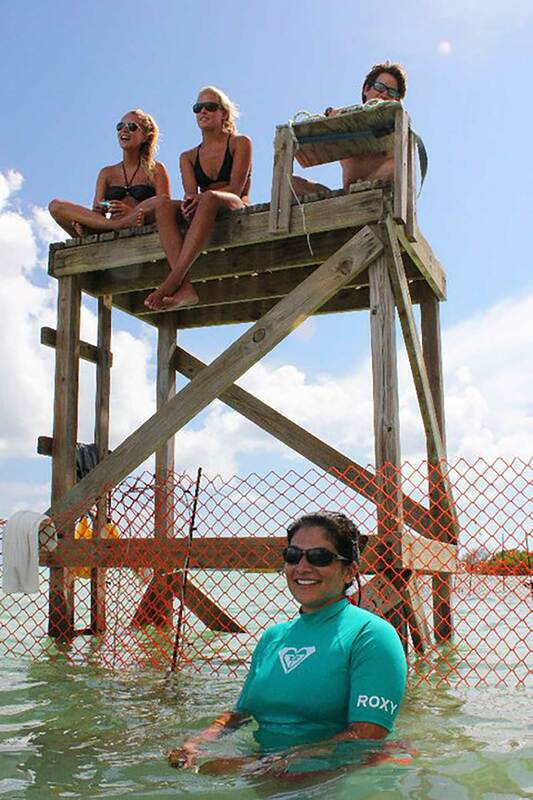 If it were not for the Sharklab, I probably would not have had the opportunity to go into the field that I am in, which is so competitive, especially in Miami. If it weren’t for the lab, I may not have gotten accepted to RSMAS, which in turn would not have earned a degree in an area I absolutely love, and I would not have gotten a job that I am so very thankful for in this competitive field! The Sharklab will always be a second home to me.